I am happy to join with you today in what will go down in history the greatest demonstration for freedom in the history of our nation. Five score years ago, a great American, in whose symbolic shadow we stand today, signed the Emancipation Proclamation. This momentous decree came as a great beacon of hope to millions of slaves, who had been seared in the flames of withering injustice. It came as a joyous daybreak to end the long night of their captivity. But one hundred years later, the colored America is still not free. One hundred years later, the life of the colored American is still sadly crippled by the manacle of segregation and the chains of discrimination. One hundred years later, the colored American lives on a lonely island of poverty in the midst of a vast ocean of material prosperity. One hundred years later, the colored American is still languishing in the corners of American society and finds himself an exile in his own land. So we have come here today to dramatize a shameful condition. In a sense we have come to our Nation's Capital to cash a check. When the architects of our great republic wrote the magnificent words of the Constitution and the Declaration of Independence, they were signing a promissory note to which every American was to fall heir. It is obvious today that America has defaulted on this promissory note insofar as her citizens of color are concerned. Instead of honoring this sacred obligation, America has given its colored people a bad check, a check that has come back marked "insufficient funds." 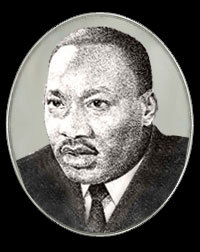 Now it the time to lift our nation from the quicksand's of racial injustice to the solid rock of brotherhood. Now is the time to make justice a reality to all of God's children. It would be fatal for the nation to overlook the urgency of the moment and to underestimate the determination of its colored citizens. This sweltering summer of the colored people's legitimate discontent will not pass until there is an invigorating autumn of freedom and equality. Nineteen sixty-three is not an end but a beginning. Those who hope that the colored Americans needed to blow off steam and will now be content will have a rude awakening if the nation returns to business as usual. We cannot be satisfied as long as the colored person's basic mobility is from a smaller ghetto to a larger one. We can never be satisfied as long as our children are stripped of their selfhood and robbed of their dignity by signs stating "for white only." No, no we are not satisfied and we will not be satisfied until justice rolls down like waters and righteousness like a mighty stream. Go back to Mississippi, go back to Alabama, go back to South Carolina, go back to Georgia, go back to Louisiana, go back to the slums and ghettos of our modern cities, knowing that somehow this situation can and will be changed. I have a dream that one day out in the red hills of Georgia the sons of former slaves and the sons of former slave owners will be able to sit down together at the table of brotherhood. I have a dream that one day down in Alabama, with its vicious racists, with its governor having his lips dripping with the words of interposition and nullification; that one day right down in Alabama little black boys and black girls will be able to join hands with little white boys and white girls as sisters and brothers. This will be the day when all of God's children will be able to sing with new meaning "My country 'tis of thee, sweet land of liberty, of thee I sing. Land where my father's died, land of the Pilgrim's pride, from every mountainside, let freedom ring!" But not only that, let freedom, ring from Stone Mountain of Georgia. When we let freedom ring, when we let it ring from every tenement and every hamlet, from every state and every city, we will be able to speed up that day when all of God's children, black men and white men, Jews and Gentiles, Protestants and Catholics, will be able to join hands and sing in the words of the old spiritual, "Free at last, free at last. Thank God Almighty, we are free at last."